GEM live is a fresh and exciting new lifestyle brand that fuses the latest innovations in technology with the hottest trends in luxury experiences. Started in 2018 this inspiring start-up is set to elevate contemporary passions around premium dining concepts, experiential entertainment and the growing craze around novel lifestyle events, creating greater value to both customers seeking the next new thing and businesses who thrive on providing these experiences. Progressive, luxurious and full of imagination, GEM live is infusing a vibrant dynamic into the lifestyle of Kuala Lumpur and on track to expand its brand across Southeast Asia by 2020. Name : ASIA BIOENERGY TECHNOLOGIES BHD. ............stevies n macquack like sayur basi masak kari,gulung tikar,e-conmoney!!! (b) MPex - a mobile payment exchange system that allows users to conduct transactions both online and at points of sale via multiple payment options such as smartphones using Quick Response code technology.Further, the Group intends to leverage on its existing experience, technologies and infrastructures in the mobile payment segment to venture into the mobile application space via the development of a lifestyle application known as GEM. (c) Events – purchase tickets for an upcoming concert, musical, comedy show or other entertainment events and obtain priority lane privileges to skip the queue. Upon selecting a specific event / venue, users will be provided with detailed information on the event / venue including promotional packages and other exclusive in-app purchases. For example, for an F&B outlet, users may make a reservation for a table or VIP room at their desired timeslot as well as pre-order their selection of food items on a set menu at a promotional price.The app also provides an option for users to book transportation to and from the event/ venue, thus providing a more comprehensive solution from reservation to transportation without having to leave the app.Apart from these principal functions, the GEM app features a social media platform that allows users to invite their friends or other GEM users to an event or venue that they have made a reservation or purchased tickets for. Through the GEM app’s own messaging function, users that have been invited to a particular reservation can participate in a group chat to discuss on the event / venue and socialise, thereby avoiding the need to message individual users separately or create a separate chat group in another messaging app just for that particular reservation.Users can also share their experience with an event / venue by uploading photos, providing ratings and/or writing personalised reviews. Events / venues which are highly rated with good reviews, or those which have high popularity or user traffic, will be pushed to the top of the selection list, increasing their visibility.The GEM app also comes with a customer loyalty feature whereby users will earn in app points for every transaction made through the app. Accumulated points can be redeemed by users to unlock rewards such as discounted or free tickets for events, promotional vouchers or other promotions sponsored by merchants.For transactions made through the GEM app, the total bill (which may comprise reservation fees, pre-orders, ticket purchases, transportation fees and other in-app purchases) will be processed via an online payment gateway managed by GEM, which will charge users a payment gateway fee for each payment made by users through the GEM app. GEM will also charge merchants i.e. owners of the event / venue a commission for each payment made by users via the app. Other sources of income from the GEM app may also include advertisement fees and content sponsorship features. (c) most reservations can usually only be made by telephone. For F&B businesses which have online reservation features, each outlet or event will have their own distinct platform or website for users to navigate. With the GEM app, users can now conveniently access a list of popular restaurants / events / venues and make a reservation with just a few clicks under a single platform.Users can also bookmark their favourite event / venue to enable quicker reservations /purchases for future visits. With this feature, users will no longer have to save and manage the contact details of their favourite restaurant or bookmark websites to buy tickets for their favourite event / venue for future visits as past reservations / purchases are recorded in the GEM app.Users will also be updated on new restaurant / F&B outlet openings, upcoming events and related entertainment news through a special section in the app. Through this function, users will be able to discover new restaurants / events / venues and keep up with the current trends in the F&B, lifestyle and entertainment scene. For merchants, the GEM app provides another platform for them to reach out and attract new customers in addition to existing physical stores, websites and/or social media presence. Merchants will be able to access the mobile application space by listing and promoting their event / venue in the GEM app at a relatively cheaper cost.By riding on the GEM app, merchants may save significant time and resources, which otherwise would be committed to develop and maintain their own proprietary mobile application. The GEM app also helps merchants to retain existing customers via the convenient option to bookmark an event / venue and making repeat reservations / purchases with a single click under a single application. Merchants also have the option to advertise promotional deals or exclusive events via push notifications to selected target consumers in the GEM app.The first phase of development of the GEM app was completed and the app was launched in October 2018. The app is currently undergoing upgrading and enhancement with additional features to be continually added and existing features to be continually improved. 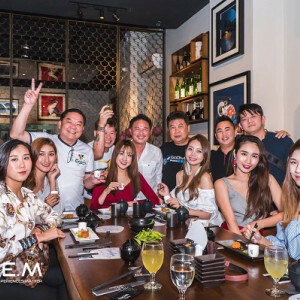 Additional features may include a platform for members to discover and use F&B establishments as workspaces during their off-peak hours and GEM’s own payment platform, which will replace the current third-party payment gateway, both of which are expected to be launched by year 2020. The GEM app can be downloaded from iTunes (for Apple iOS) or from Google Play (for Android). As at 16 January 2019, NetX has invested approximately RM3.0 million for the first phase of development of the GEM app and there are more than 10,000 registered users on the app with more than 300 merchants. This announcement is dated 16 January 2019. Reservation-booking app Resy just got a massive investment from Airbnb, one of the most valuable startups in the world . New York-based startup Resy can now count one of the most valuable startups in the world as an investor. The reservation booking app has raised a $13 million funding round led by Airbnb, the home-sharing startup currently worth $30 billion. Payment technology company First Data and venture capital firms Lerer Hippeau Ventures and RSE Ventures also participated in the round. The new cash infusion values Resy at $70 million, according to PitchBook. Resy was founded in 2014 by Eater.com cofounder Ben Leventhal, entrepreneur Gary Vaynerchuk, and CrowdTwist cofounder Mike Montero. Resy allows users to make reservations at restaurants in more than 50 cities nationwide. Resy says it now seats more than 1.4 million diners each month and has roughly 1,000 restaurants on the site. c) Events – purchase tickets for an upcoming concert, musical, comedy show or other entertainment events and obtain priority lane privileges to skip the queue. Upon selecting a specific event / venue, users will be provided with detailed information on the event / venue including promotional packages and other exclusive in-app purchases. For example, for an F&B outlet, users may make a reservation for a table or VIP room at their desired timeslot as well as pre-order their selection of food items on a set menu at a promotional price.The app also provides an option for users to book transportation to and from the event/ venue, thus providing a more comprehensive solution from reservation to transportation without having to leave the app.Apart from these principal functions, the GEM app features a social media platform that allows users to invite their friends or other GEM users to an event or venue that they have made a reservation or purchased tickets for. Through the GEM app’s own messaging function, users that have been invited to a particular reservation can participate in a group chat to discuss on the event / venue and socialise, thereby avoiding the need to message individual users separately or create a separate chat group in another messaging app just for that particular reservation.Users can also share their experience with an event / venue by uploading photos, providing ratings and/or writing personalised reviews. 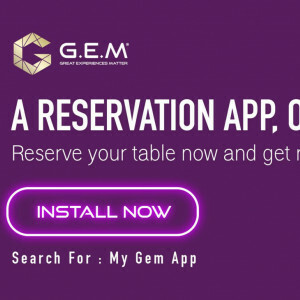 Events / venues which are highly rated with good reviews, or those which have high popularity or user traffic, will be pushed to the top of the selection list, increasing their visibility.The GEM app also comes with a customer loyalty feature whereby users will earn in app points for every transaction made through the app. Accumulated points can be redeemed by users to unlock rewards such as discounted or free tickets for events, promotional vouchers or other promotions sponsored by merchants.For transactions made through the GEM app, the total bill (which may comprise reservation fees, pre-orders, ticket purchases, transportation fees and other in-app purchases) will be processed via an online payment gateway managed by GEM, which will charge users a payment gateway fee for each payment made by users through the GEM app. GEM will also charge merchants i.e. owners of the event / venue a commission for each payment made by users via the app. Other sources of income from the GEM app may also include advertisement fees and content sponsorship features. (c) most reservations can usually only be made by telephone. For F&B businesses which have online reservation features, each outlet or event will have their own distinct platform or website for users to navigate. With the GEM app, users can now conveniently access a list of popular restaurants / events / venues and make a reservation with just a few clicks under a single platform.Users can also bookmark their favourite event / venue to enable quicker reservations /purchases for future visits. With this feature, users will no longer have to save and manage the contact details of their favourite restaurant or bookmark websites to buy tickets for their favourite event / venue for future visits as past reservations / purchases are recorded in the GEM app. Users will also be updated on new restaurant / F&B outlet openings, upcoming events and related entertainment news through a special section in the app. Through this function, users will be able to discover new restaurants / events / venues and keep up with the current trends in the F&B, lifestyle and entertainment scene. For merchants, the GEM app provides another platform for them to reach out and attract new customers in addition to existing physical stores, websites and/or social media presence. Merchants will be able to access the mobile application space by listing and promoting their event / venue in the GEM app at a relatively cheaper cost.By riding on the GEM app, merchants may save significant time and resources, which otherwise would be committed to develop and maintain their own proprietary mobile application. The GEM app also helps merchants to retain existing customers via the convenient option to bookmark an event / venue and making repeat reservations / purchases with a single click under a single application. Merchants also have the option to advertise promotional deals or exclusive events via push notifications to selected target consumers in the GEM app.The first phase of development of the GEM app was completed and the app was launched in October 2018. The app is currently undergoing upgrading and enhancement with additional features to be continually added and existing features to be continually improved. Additional features may include a platform for members to discover and use F&B establishments as workspaces during their off-peak hours and GEM’s own payment platform, which will replace the current third-party payment gateway, both of which are expected to be launched by year 2020.
has proposed to raise as much as RM15.36mil by placing out 1 billion new shares in the company to independent third party investors. Shares in Netx was last traded at 2 sen. The company, in a filing with Bursa Malaysia on Wednesday, said the new shares will be placed out at 1.48 sen a share. Proceeds from the exercise will be used for the development of its lifestyle mobile application known as GEM. With all the festivities seemingly past, its time to kick back and enjoy the weekend ahead to yourself.And what better way than to indulge in a hearty meal, or even a warm cup of coffee. Here are some of our best merchants with amazing ambience which will surely set the mood. Doing placement share buisness where got meaning. Well you asked for it, and here it is! The highly anticipated second episode of Hidden Gems is here! This time, the Gem Squad paid Uroko's Nova Saujana outlet a visit. Located strategically along Subang Airport Road, right across from Oasis Square and Citta Mall making it super accessible while at the same time, peacefully nestled in the serene landscape of Nova Saujana. 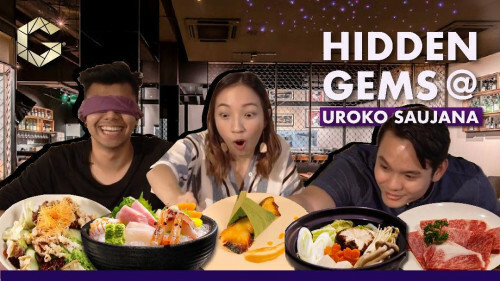 Join our Gem Squad and their shenanigans as they embark on a gastronomical adventure of Japanese proportions. 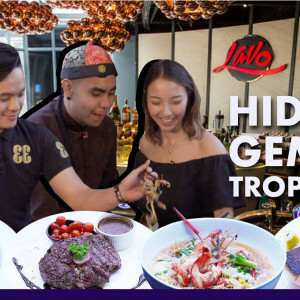 We are excited to share with you the first episode of Hidden Gems! Watch how our hosts take LAVO’s menu for a spin. LAVO Restro & Wine Atelier won the Best of Award of Excellence 2018 recognized by Wine spectator from the States (New York). They carry 1,642 labels and more than 60,000 bottles of both new and old world wines from all over the world. Being a pork-free restaurant, LAVO serves a wide range of food from western cuisine to local Asian cuisines. LAVO also boasts a 200-inch big screen TV for the best football, F1 and other sports matches screening experience. As a wine expert, you can expect wine pairing dinners hosted here by international wine makers. Built with a spacious layout, LAVO is also perfect as an event space for corporate and private events. LAVO is opened through out the Chinese New Year holiday with special Chinese New Year packages so rally up your gang for a festive feast here! Don’t forget to check out their crazy Happy Hour beer promotions too. Love what you see here? Reserve your table at LAVO, our exclusive partner on GEM now.